How many accounts would you say is too many? Some people might answer with something low such as 5, others might say 10 or even 20. But for some, that is just pennies on the dollar. They think that having thousands, or even 10s of thousands of accounts is normal, especially when they can get free faucet account creation and delegation from @steem through Steemit. The "Dart" and "Constructor" faucet farms (named after their original main accounts) have been updated. A total of 3,497 new accounts have now had their @steem delegation removed by Steemit. This is a very large amount of delegation returned to the faucet, which amounts to around 50,000 SP (basically a free Orca account). If this was just on one account that would rank them in the top 375 of all Steem accounts by SP. This also equates to around a $1.30 vote at the time of writing. Between these two groups there are over 25,000 accounts. It is very likely that the same person operates these farms as transfers have been found linking them. I first heard of Dart a little after I joined @steemcleaners about a year ago now. But from what I know of them is that they have been abusing Steem since the beginning. Throughout their history they have changed up their tactic many times. You name it, they have probably done it. You can find out more about different types of farming techniques here. Recently it was discovered that 1,000s of accounts were transferring funds to an account called @curations, each with the memo curation_reward. Pretty suspicious don't you think? Each of these account were doing the exact same thing, they were all set up to simply upvote other peoples content. Which is definitely a new tactic, normally these farms are setup to self vote their own accounts. But this is still abuse, they have created thousands of accounts through Steemit, they are only allowed one. Plus they are still earning curation rewards from voting and this comes from the reward pool that we all share. As you can see below they have been doing this for months, this is the same for the other accounts too. 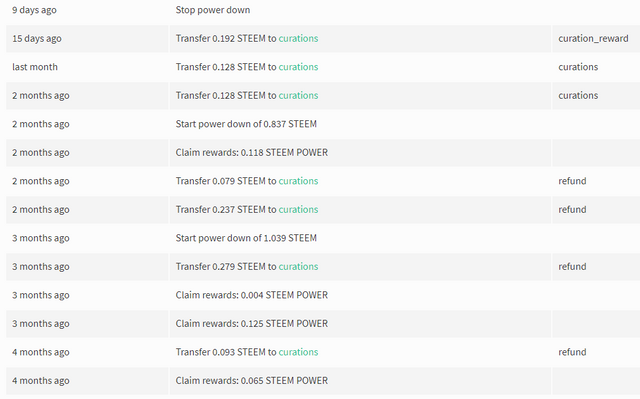 A power down was also initiated on multiple occasions as well, this is so they can cash out the funds and then get their @steem delegation topped up automatically. I mean they wouldn't want to end up using their own SP would they. Then once or twice a month (it used to be a lot more) transfer out the earnings via the @bittrex exchange. 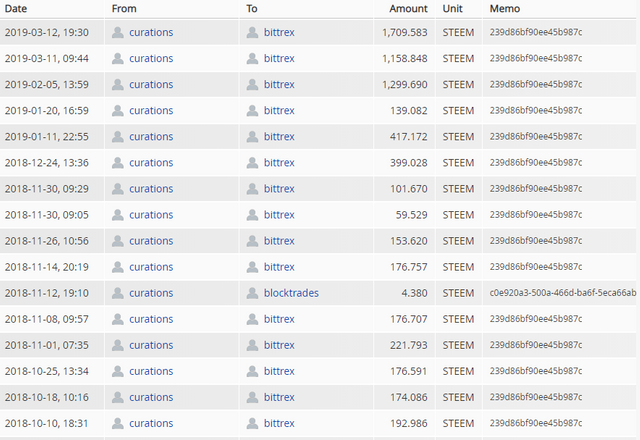 As you can see in the screenshot below they have sent thousands of Steem. This isn't even the only account, they have many others that have sent 10s of thousands of Steem and SBD. Notably @dart, @tard, @luckdiver and many more. In the past they have used other exchanges too. I'm sure this won't be the last of it, but hopefully it has put a slight dent in it for the time being. You can read more about which accounts were added here #67. Because of the PR, Steemit Inc removed the delegation to these accounts. 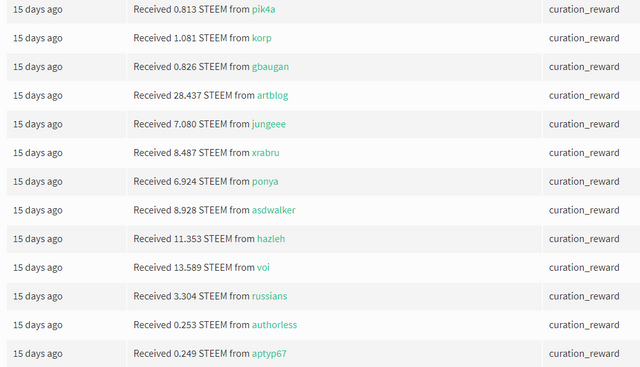 I see the abuser(s) continued to reap rewards through free delegations from @steem. I do recognize the @whitebot account. I have received votes from them a while back. 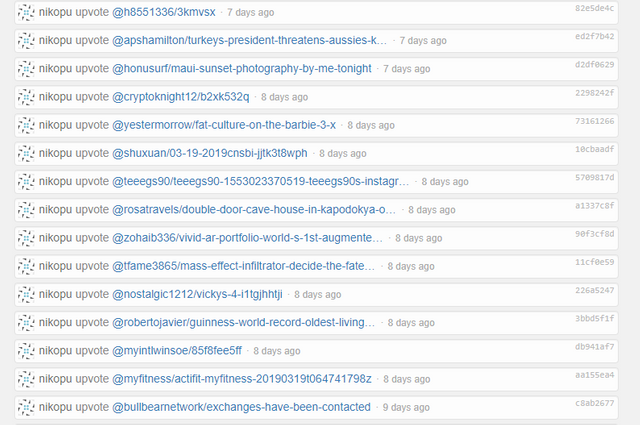 It seems deceptive that they are "curating" other Steemians' content with faucet delegations. I have no doubt they are frontrunning large upvotes to earn disproportional rewards. There is nothing anyone can do about the pending rewards on legitimate content. While I am appreciative of Steemit Inc. being more active in removing these delegations, this is their problem. Instead of having a way to delegate RC to new users, they receive free voting power on top. I am surprised that neither @ned nor the top witnesses have made statements in regards to this matter. I suppose 50K SP is not a big deal in the grand scheme, but what happens when more than one @dart group shows up? How much of that 11.4M SP will have to be in the hands of abusers before they come up with preventive measures? Or are they the operators themselves? Cynicism aside, abusers continue to adapt to their changing environment. Anti-abuse initiatives will have to change tactics. In this case, it seems only Steemit holds the solution to this type of exploit. While I am appreciative of Steemit Inc. being more active in removing these delegations, this is their problem. Yes, it is great that they DO remove the delegations, but having a system that prevents these abusers from creating these farms in the first place would be far more effective. As of now I'm unsure what checks are made, if any? This is definitely a feature that I'm 100% for. I have seen a number of witnesses and members of the community in agreement with this. Yes that is true, but if you take in the entire 40,000 accounts that are now on the list of delegation bans, we are talking whale SP numbers, and there are still more accounts that need to be added to it. Thank you for your review, @enforcer48! Keep up the good work! That's just way too many. 1 is good enough but whoever owns that is making a living with this website alone, crazy and absurd. Yes, if you give an abuser an inch, they will take a mile. They have definitely earned a pretty penny from scamming the Steem faucet. The problem is not that they have that many accounts. The problem is that those are not their stake. They are literally profiting off of delegations meant to help newbies. I didnt make nearly as much steem in my year here as these abusers in a few weeks. Yup, unfortunately that is how it goes, that's why we have to try and keep on top of it so it doesn't get even worse! 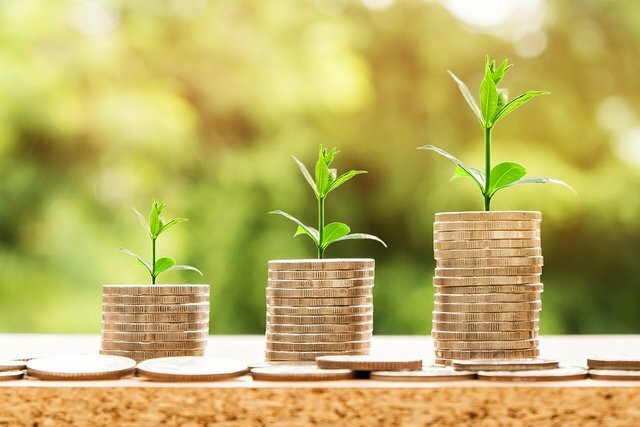 Your UA account score is currently 6.085 which ranks you at #295 across all Steem accounts. In our last Algorithmic Curation Round, consisting of 181 contributions, your post is ranked at #46.